This walk begins from the village of Pyecombe and climbs to the two windmills at Clayton (known as Jack and Jill). 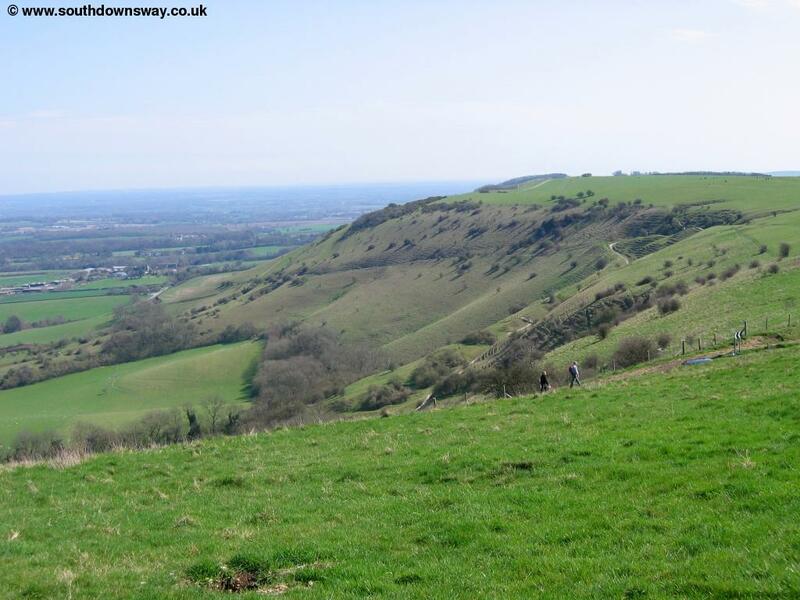 From there the path climbs to the top of the downs passing Coombe Bottom and the beautiful Ditchling Beacon, as well as a couple of dew ponds. 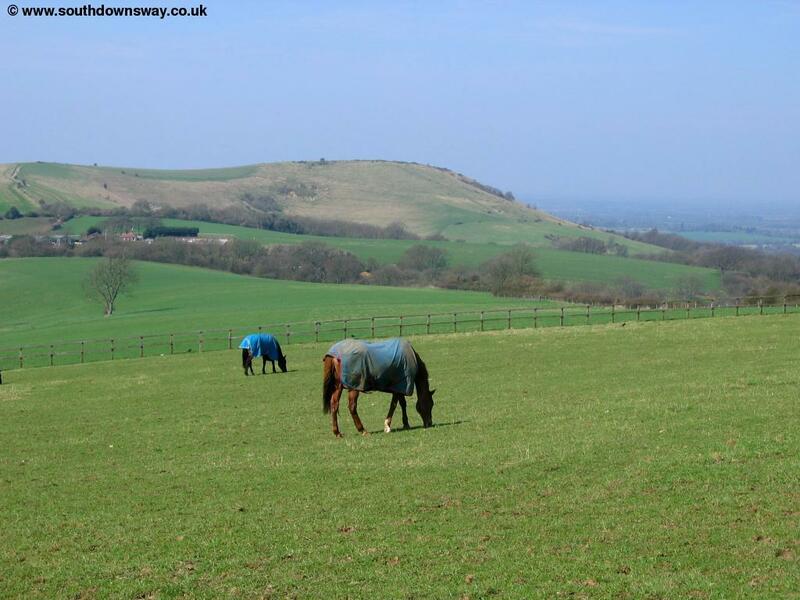 Soon the South Downs Way turns to the right but here continue straight on to Blackcap then follow the bridleway down past the old racecourse and in to the attractive Saxon town of Lewes. 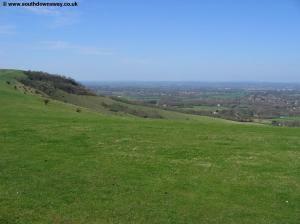 Pyecombe is just off the A23 (London to Brighton road). As you approach Brighton exit when signed for Pyecombe. If you miss the turn there is a second turn shortly after which you can take past the garage and into Pyecombe. From the South exit again when signed, it's the second junction after the A27 roundabout. 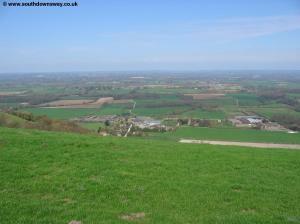 Pyecombe is also just off the A273 just before the junction for the A23 when heading south. Parking in Pyecombe is limited to on-street parking only - Church Road appears to have the most room. If you're travelling by public transport, Compass Bus service 40 runs hourly (Monday - Saturday) from Brighton, Hassocks, Burgess Hill, Wivelsfield, Haywards Heath and Cuckfield. This bus runs close to the station in Brighton, Hassocks and Burgess Hill stations, all on the London - Brighton line. The bus stops on the A273 at the south of the village, from Brighton press the bell as you come under the flyover from the A23, as the stop is soon after. 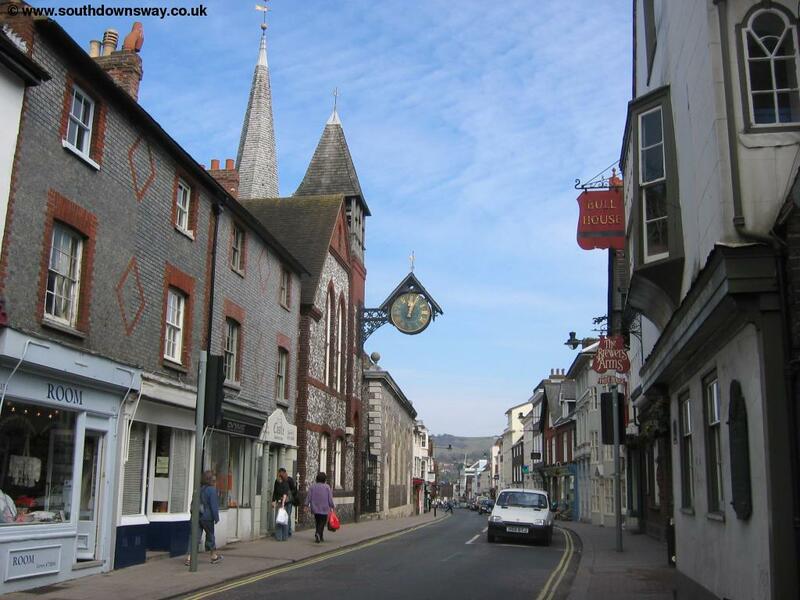 On Sundays, Pyecombe is served by Compass Travel route 100 every two hours, which runs between Storrington and Burgess Hill, running close to the station at Burgess Hill and Hassocks. There is a guaranteed connection from this bus onto route 102 at Storrington, which continues on to Amberley and Pulborough Station (on the Arun valley line). This bus provides a useful link to the main towns on or close to the South Downs Way from Amberley across to Ditchling on Sundays. 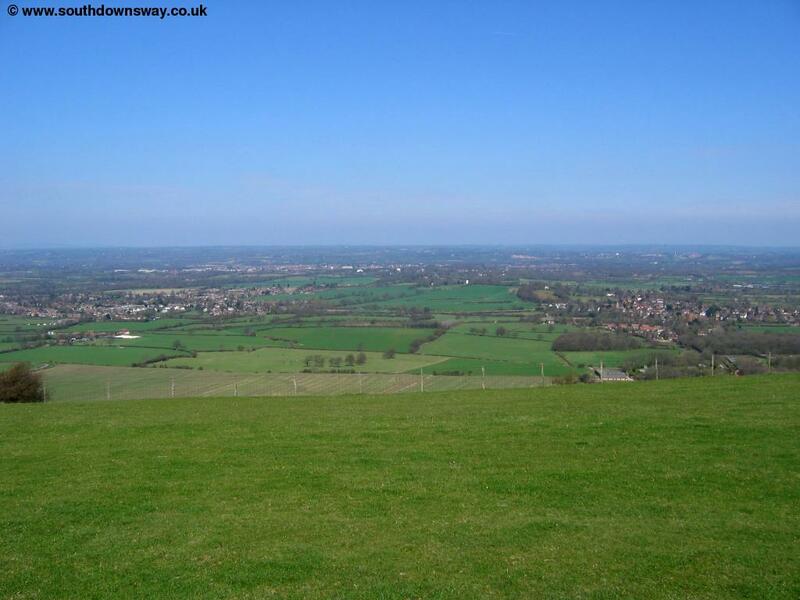 Pyecombe is also served by Metrobus route 273 which runs approximately once every two hours (Monday - Saturday) between Brighton, Hassocks, Hurstpierpoint, Hickstead and Crawley, passing close to the stations in Brighton, Crawley and Hassocks. Finally on Sundays, Metrobus service 87 runs once every two hours between Haywards Heath and Brighton via Wivelsfield, Burgess Hill, Hassocks and Hurstpierpoint. Pyecombe is a pretty little village, despite being surrounded by busy roads. The village has an attractive Norman Church. From the centre of the village, descend down School Lane towards the A273. As you get to the road turn left, allowing a narrow path beside the road, but with a welcome clump of bushes to the right, offering some protection from the road. 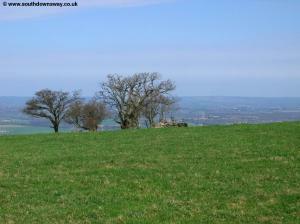 Soon the path comes out to the road which you have to cross then climb the road towards Pyecombe golf club. As you arrive the Golf Club the wide path is obvious to the left of the course, although it can get quite muddy in the winter. Take care for rogue golf balls along this section! Soon you arrive at the top of the hill where there is a junction of paths. Here turn left towards New Barn Farm. 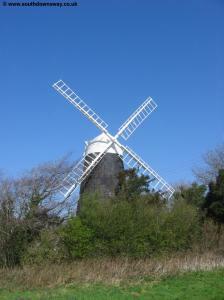 Pass through the edge of the farm yard towards the Clayton Windmills, known as Jack and Jill. The Jill windmill (the white one) is open to the public in Sundays according to the notice at the site. 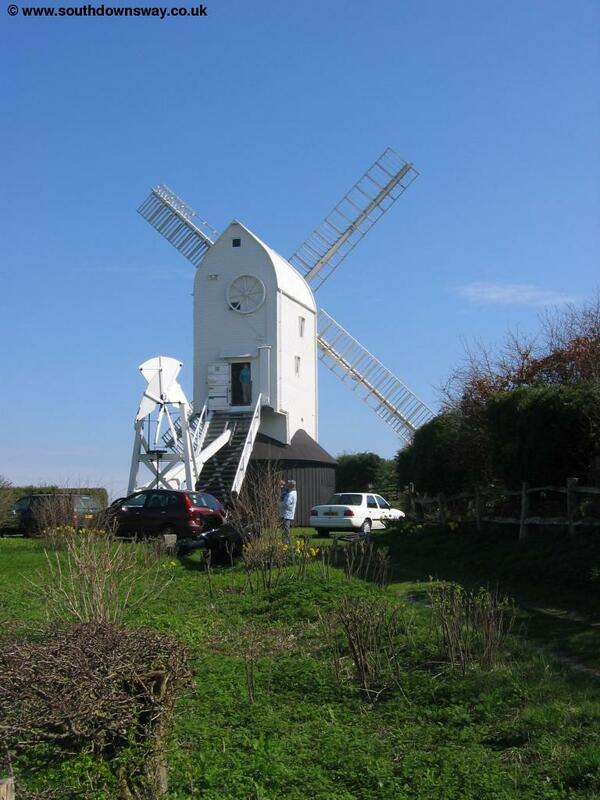 The Jack windmill is in private ownership and not open to the public. 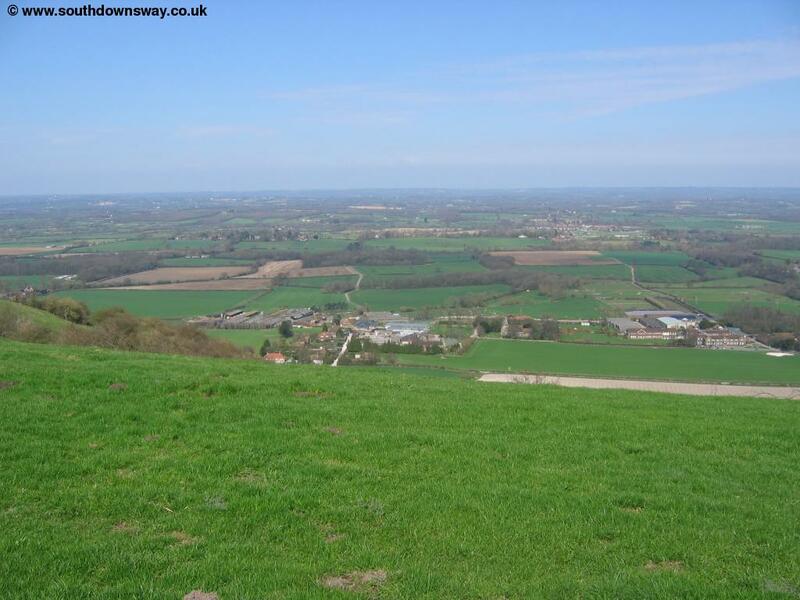 The South Downs Way turns sharply to the right before you get to the windmills, but there is a path to them. The path doesn't actually go right up to the windmills, so if you walk there re-trace your steps back. 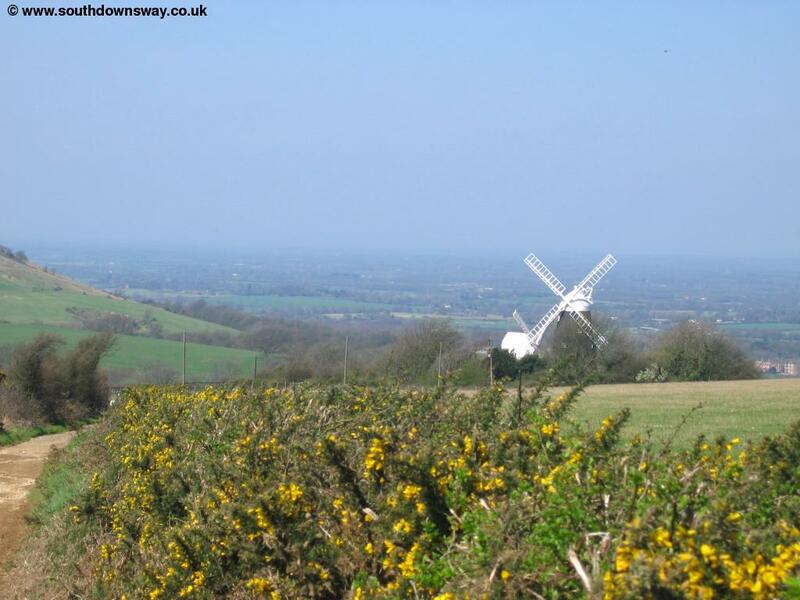 From the windmills, the path climbs on to the top of the hill, overlooking Coombe Bottom to the north and offering lovely views to the north (where the land is surprisingly flat) and to the south to the edges of Brighton and the coast. 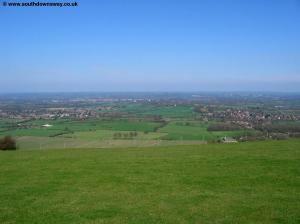 The top of this hill is also where the path passes from West Sussex into East Sussex. 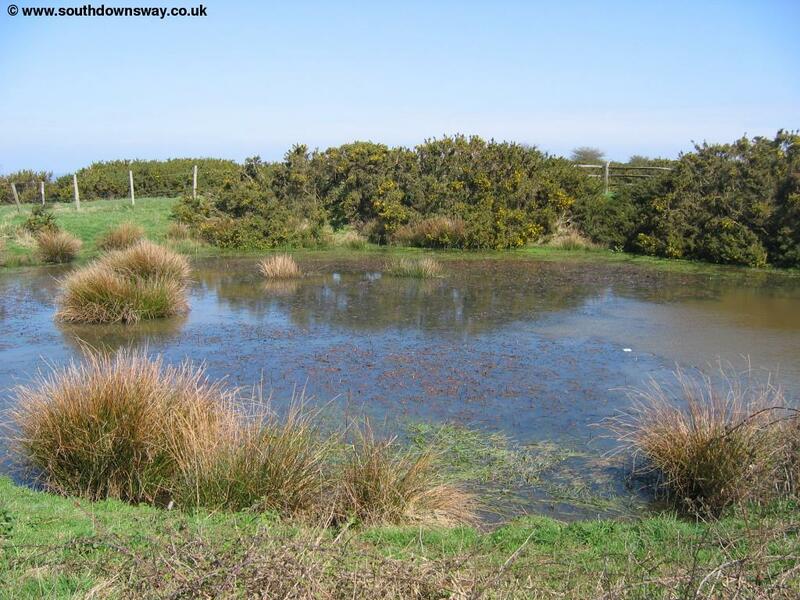 Beyond Coombe Bottom the path passes two old Dew Ponds. These ponds were used for providing water for sheep before piped water. They work by having a layer of clay placed at the bottom to stop the water soaking into the chalk allowing them to hold the rainwater. 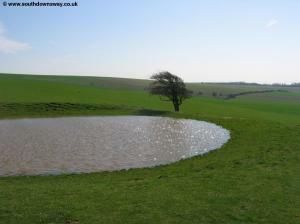 Beyond the two dew ponds the path continues at a high-level overlooking Ditchling to the north. 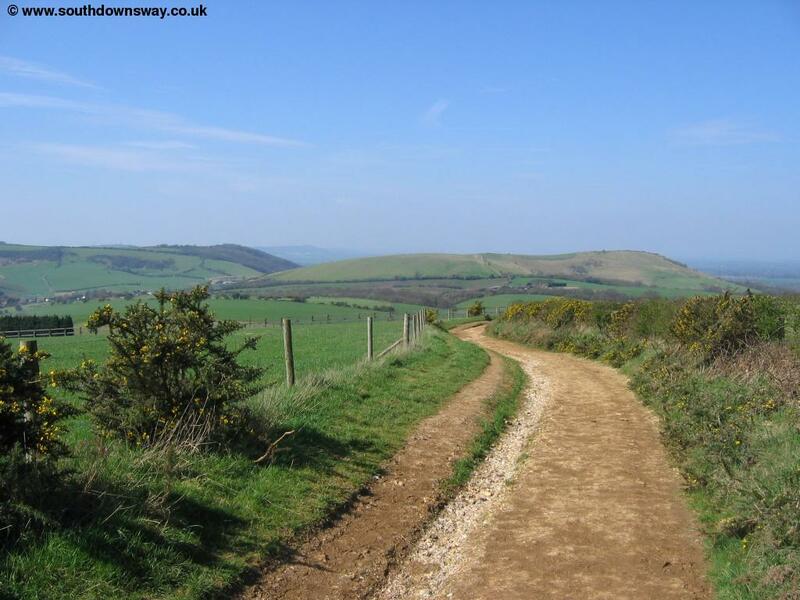 Soon the path heads towards the beauty spot of Ditchling Beacon, apparently the highest point on the South Downs and it's also the site of an Iron Age Fort. The deep an impressive valley is worth exploring and there is a footpath to the bottom of the valley. Beyond the top of the hill you come to the National Trust car park where there is sometimes an ice cream van providing welcome refreshment. 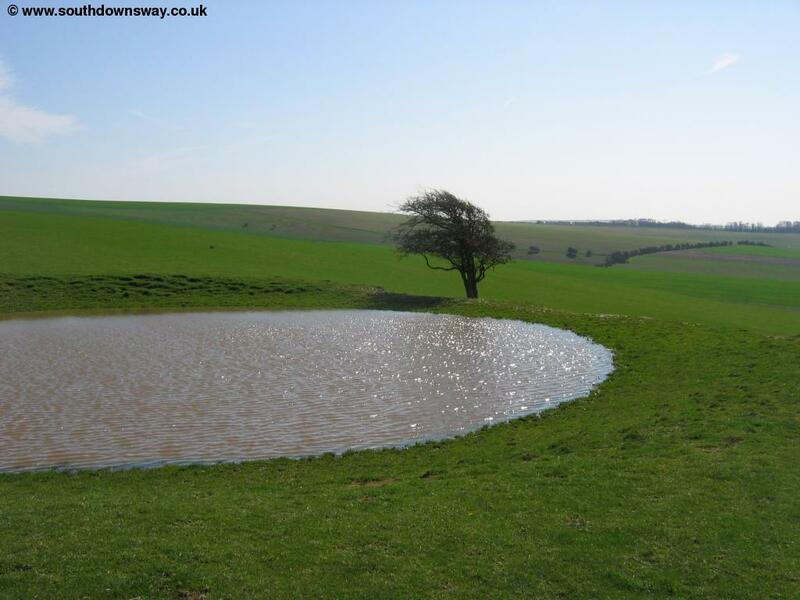 Cross the road where the path ascends slightly again, past another small dew pond where you get good views back to Ditchling Beacon and to the village of Westmeston below. As you head further east you come to another junction of paths where you continue straight on. Soon to the left you have views over the buildings of the agricultural college at Plumpton and the pretty Plumpton Palace with it's lake below. Soon you pass some wind-blown trees on top of the downs to your left, somehow managing to survive in such an exposed location. 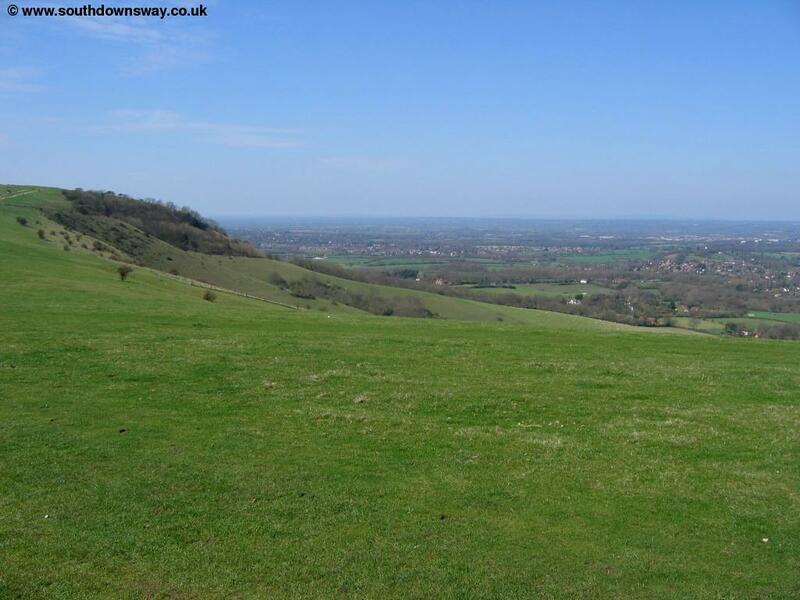 In another mile or so the South Downs Way turns sharply to the left, descending towards the A27. Here instead of turning right continue straight on as the path climbs around the edge of Blacktop with an attractive collection of trees on the top. From the top of the hill there are good views and you should continue on the wider main path, ignoring the small path off to the left passing instead just to the right of the small clump of trees at Mount Harry. This path now pases the remains of the old Lewes race course. The site of the old stand is obvious and many of the buildings are still being used as a stable. 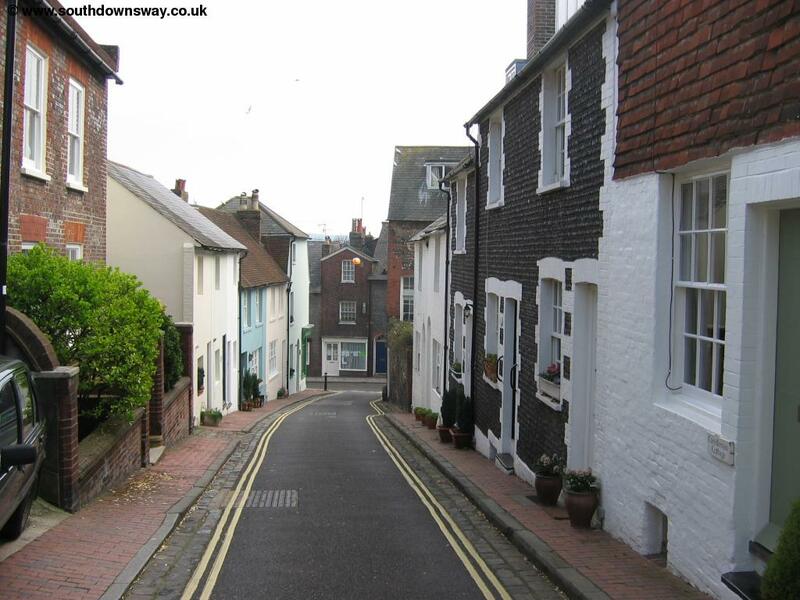 Soon you come to a collection of houses following the signed path straight on as the path then descends adjacent to a narrow road. 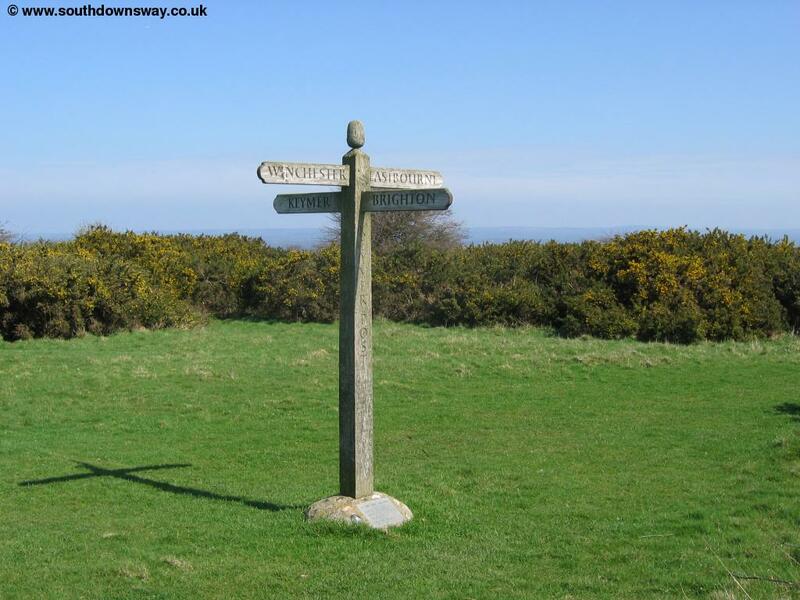 You emerge at the main road (the A275) which you cross continuing straight on on the path which soon emerges onto the aptly named Hill Road. Descend Hill Road and when there is an odd raised junction onto the main road to the left continues straight on into King Henry's Road. 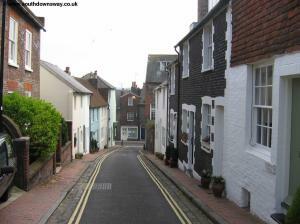 This road then joins White Hill into the centre of the lovely town of Lewes. The centre of Lewes is very pleasant with many old buildings and the remains of the castle (which is open to the public). The river Ouse also passes through the town. 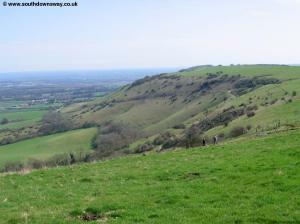 There are no direct buses back to Pyecombe from Lewes (and Pyecombe does not have a station). 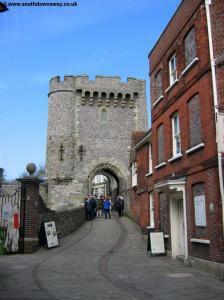 Instead you'll need to get a train from Lewes station to Burgess Hill or Hassocks to the north or Brighton to the south (all operated by Southern) although you'll normally have to change at Wivelsfield for Burgess Hill (and often for Hassocks) but you can get direct trains from Lewes to Brighton. From all these places there are buses to Pyecombe. From Brighton Compass Bus service 40 runs hourly (Monday - Saturday) to Pyecombe from Old Stein (near the pier and pavilion) and up the A23 through Brighton (a short walk from the rail station). 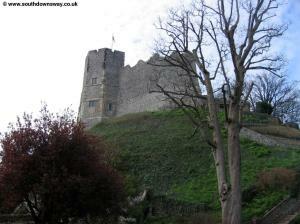 This bus also passes close to Burgess Hill and Hassocks stations if you travel back this way. 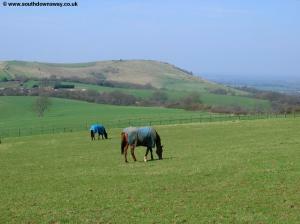 On Sundays, Metrobus service 87 goes to Pyecombe from Brighton, Burgess Hill, Wivelsfield, Hassocks and Haywards Heath. In addition Metrobus service 273 runs a few times daily (except Sunday) to Pyecombe from Brighton, Hassocks and Crawley. If you travel back via Brighton (as I did) you need to be careful to spot the bus stop in Pyecombe. As the bus leaves Brighton on the A23 and picks up speed it soon heads onto the A273 going under the A23 - the stop is almost immediately after this point on the left just after passing the Kwik Fit garage on the left.